Montreal based melodic death metallers KATAKLYSM will kick off the European leg of the Death… Is Just The Beginning tour with label-mates HYPOCRISY and THE SPIRIT this Thursday!. Today, the band offer a new music video for “...And Then I Saw Blood” in celebration of the upcoming trek. 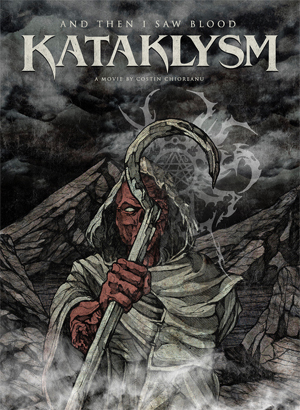 KATAKLYSM explored a new creative and artistic side when they hired acclaimed Romanian visionary artist Costin Chioreanu to tell the story of “...And Then I Saw Blood”. The video chronicles a post-apocalyptic world dominated by A.I. Two dying brothers are brought to a facility where their minds are uploaded into a digital virtual world dominated and controlled by oppressors of mankind. As hope appears to defy the system in place, the two brothers are forced to make a decision to either follow their human instinct or their new found conscious. KATAKLYSM frontman comments “"...And Then I Saw Blood" can be interpreted in many different ways as it has an open concept to it. Everyone can see it the way they want but we wanted an animated video done with an artistic flair. Costin was the perfect artist to do it. I told him the central theme of the track deals with the betrayal of two close friends. I asked him to bring in his own world on how he envisioned the song and theme. Costin totally out did himself in this futuristic but realistic interpretation of where we are headed as people continue to get absorbed by technology and this urge to create something bigger, stronger, and more intelligent in this obsession to become godlike."